The first two days of January marked the end of a cold spell which began the day before Christmas. Temperatures both days averaged nearly 20°F below normal. The low of 4°F on the 2nd could very well be the low temperature for the 2015-2016 winter. A 1-inch snow cover enhanced overnight cooling under clear skies. A warm ridge of high pressure aloft trapped the cold air, forming a deep inversion. 5,000 feet above the valley floor, temperatures were around 15°F warmer. Temperatures began to moderate on the 3rd as the high pressure weakened and the inversion eroded away. From the 4th through the end of the month temperatures averaged above normal on all but three days. From the 7th through the 12th, westerly flow aloft split over the coast, causing weather systems to move inland north and south of our area. 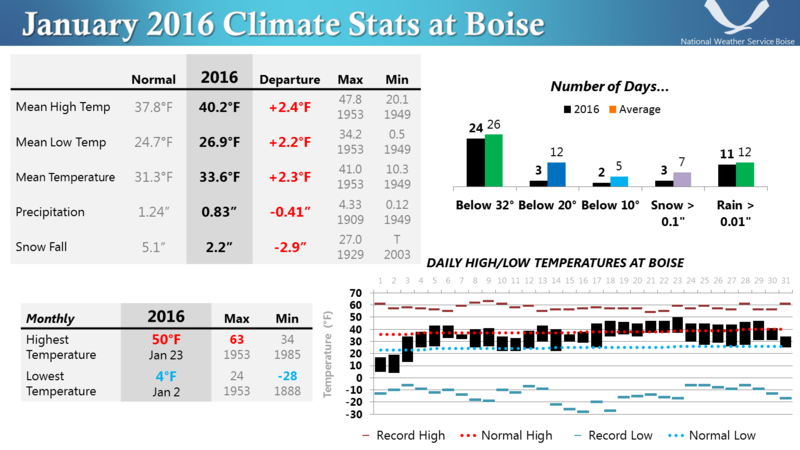 There was no rain or snow at Boise during that period. By the 13th the flow had reconsolidated, enabling precipitation to again reach Boise. A series of weather systems brought a week of wet weather, including 2 inches of snow on the 14th and 15th. From the 19th through the 27th, an upper level high pressure ridge dominated the Western U.S. The only measurable precipitation at Boise was a hundredth of an inch on the 23rd from a weather system weakened by the ridge. Starting on the 28th, very moist westerly flow replaced the ridge, bringing widespread precipitation to southwest Idaho. Rain on the 28th and 29th totaled a third of an inch at the airport. The rain ended late on the 29th after a cold front crossed the area. Cold moist and unstable air followed the front and on the 30th, a combination of afternoon heating at the surface and cold air aloft triggered convective snow showers. By early morning on the 31st, cold air had settled into the valley and areas of dense fog formed from moisture left over from the showers of the previous three days. The fog lifted during the afternoon forming a low cloud cover which prevented temperatures from rising above 34°F. The average temperature that day was below normal for the first time since the 11th.